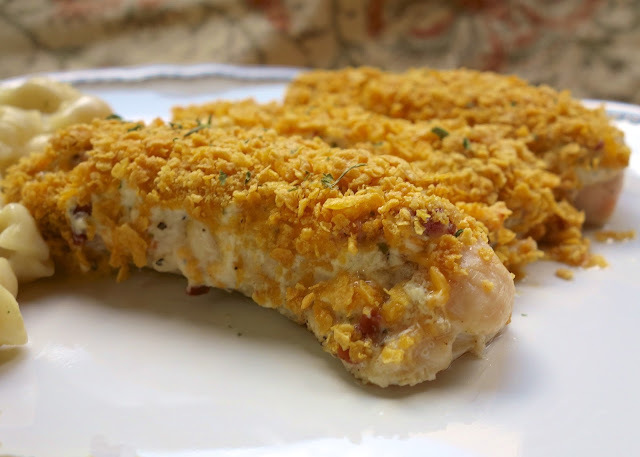 Baked "Crack Dip" Chicken Tenders Recipe - chicken tenders topped with cheddar, bacon, ranch, Greek yogurt or sour cream and cornflakes. Ready in 20 minutes! Quick weeknight meal. I adapted this recipe from my Buffalo Dip Chicken Tenders recipe. I thought if chicken fingers baked with buffalo dip was good, it would probably be even better with my Crack Dip! I was right, these chicken tenders were delicious! I used some Chobani Greek yogurt in this recipe. It cut way down on the fat, and I didn't feel as guilty eating this. If you want to cut down the fat and calories even more, use low-fat cheese and turkey bacon. This was so simple to make. You can mix together the Greek yogurt mixture ahead of time and assemble the chicken when you are ready to bake it. We both loved this dish. It had great flavor with the Ranch, cheddar and bacon (a.k.a. "Crack Dip"). This is definitely going into the dinner rotation. Lay the chicken close together on a foil lined baking sheet. Sprinkle both sides with garlic salt and pepper. Combine Greek yogurt, cheese, bacon and Ranch dressing mix. 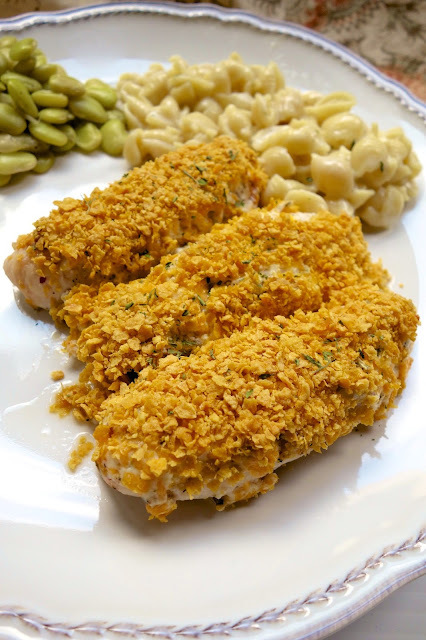 Spread Greek yogurt mixture over chicken tenders. Top Greek yogurt with the crushed corn flakes. Sounds easy and delish and I will def make it! I really love your recipes, but I have to say I'm not pleased with the giant Kraft ad that surrounds your blog now. It has lost it's coziness and browseability (is that a word?). Thanks for great recipes! Love the bacon in this and the cornflake crust! This looks fantastic!! I think I need to add this to my dinner menu for the week! They all look good to me - especially the final three. I wonder how it would be if you were to mix up the yogurt, bacon, cheese and ranch dressing mix, then dip the tenders in the mixture and roll in the crushed corn flakes and bake? Either way, I am going to try the recipe! The ingredients sound great together!! If I don't care about heart attacks, is it okay to use sour cream in place of greek yogurt? I used full-fat sour cream, and yum. I want to try it with the greek yogurt though- I think it would give the chicken a better kick.